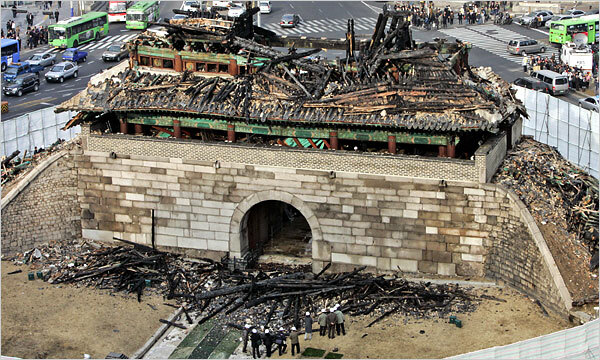 Namdaemun, Seoul’s 600-year old gate, was destroyed by arson. I’m glad I got to see it before this outrage happened. 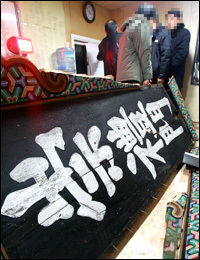 The characters were written by Yangnyeongdaegun, brother of King Sejong the Great, probably in the 1440s. I’ve been distracted by planning a spring break trip to China, but I’m going to take the time to finish the account of my brief visit to Thailand. After spending a day wandering through ruined temples in Ayutthaya, I took the hot, dirty train back to Bangkok. I had dinner at an Isan restaurant called Vientiane Kitchen. Isan is the northeast region of Thailand and the culture and language are closer to those of Laos than to the rest of Thailand. The area is poor and although crops are grown year-round, frequent droughts make life hard. This is reflected in the cuisine, in that nearly anything that can be eaten, is, from ant eggs to fried duck bills. I had sticky rice and a bowl of fiery gaeng om soup (which the menu called “bean curry”), with frog and Chinese broccoli as the main ingredients. It was really good, but the frog’s feet were included, so I was constantly picking tiny bones from my mouth. 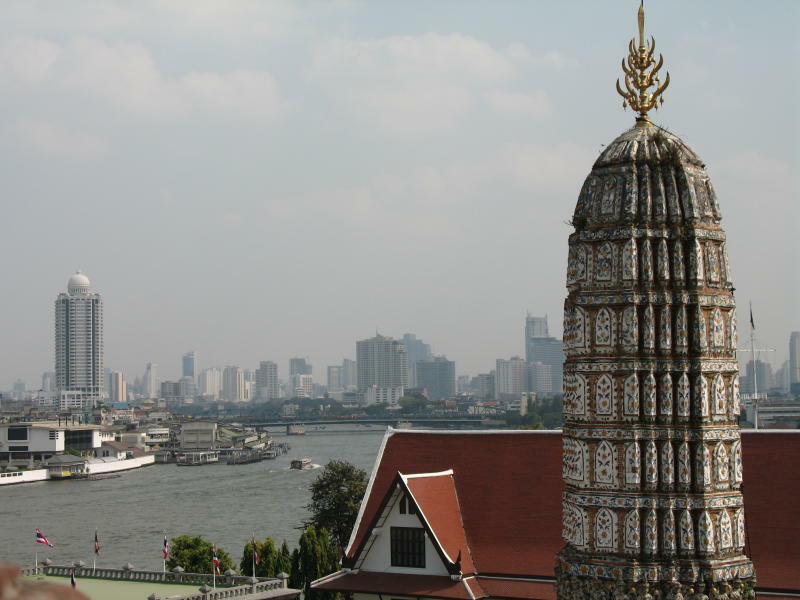 I spent the next day in Bangkok. I mostly just visited temples, but first, here’s something different. 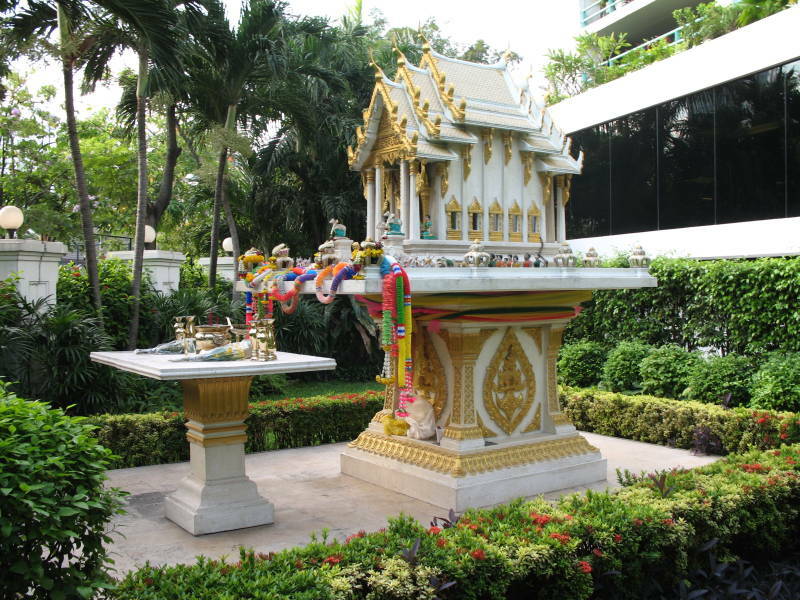 This is the hotel’s spirit house. In a tradition originating in pre-Buddhist folk beliefs, a Thai building usually has an attendant spirit house, which is just what the name says: a house for spirits. The idea is that the spirits will live there instead of in the building, and to encourage this, a spirit house should be more attractive than the building it’s attached to. After leaving the hotel, I took the elevated rail line – clean, modern, and utterly unlike the old railway to Ayutthaya – and rode to a stop near one of Bangkok’s several canals, where I caught a bus-style canal boat. Canal boats are the cheapest way to get around in Bangkok and they can provide some neat views of the city. 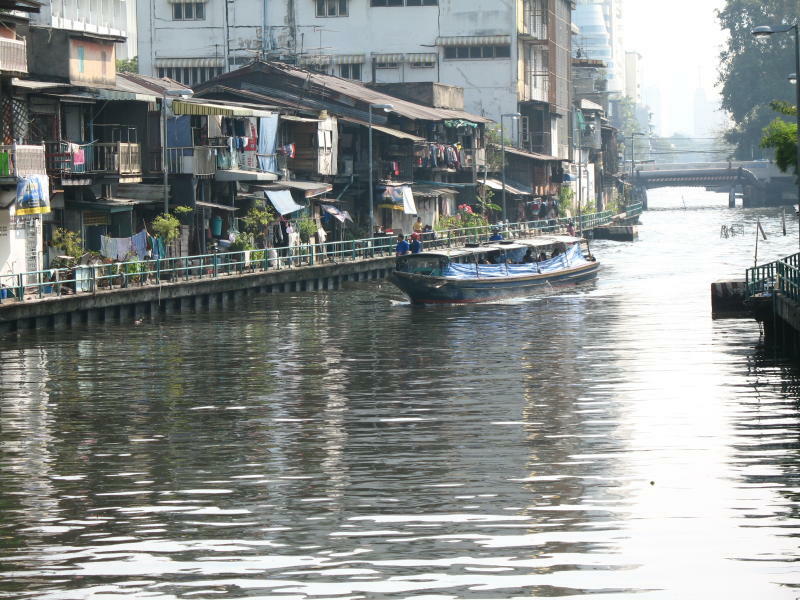 It’s a shame that many of Bangkok’s canals have been filled and paved over. 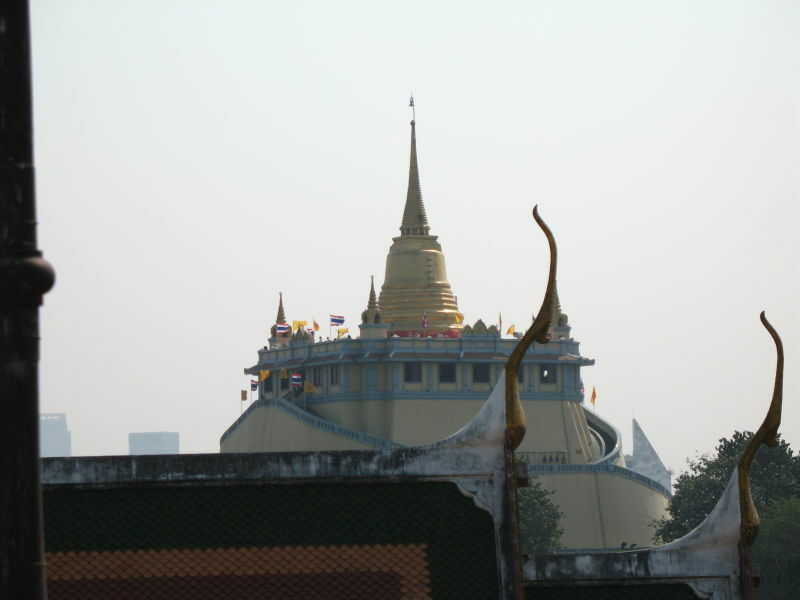 I got off at the last dock and walked to my first stop, the Golden Mount, aka Wat Saket. 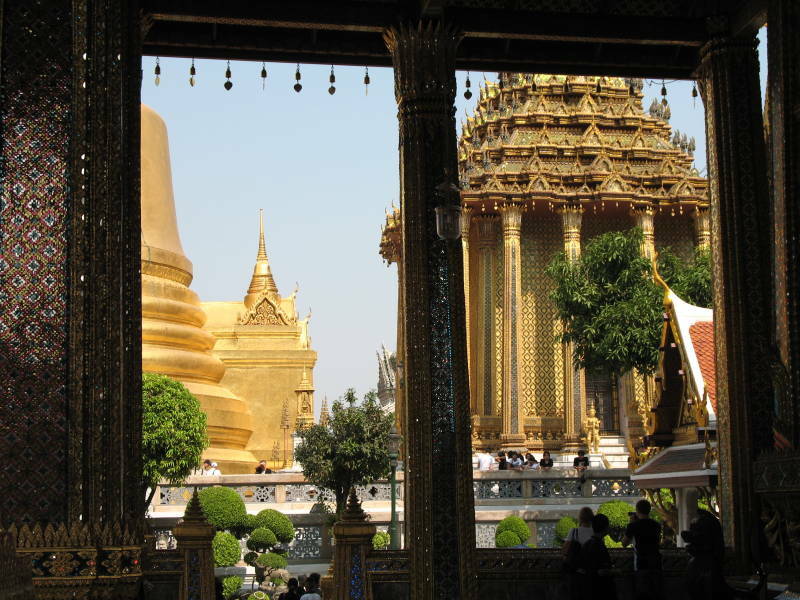 For non-devotees, there really isn’t much to see at the Golden Mount, but nearby Wat Ratchanadda (the vantage point in the picture above) was more interesting, despite being mostly empty. 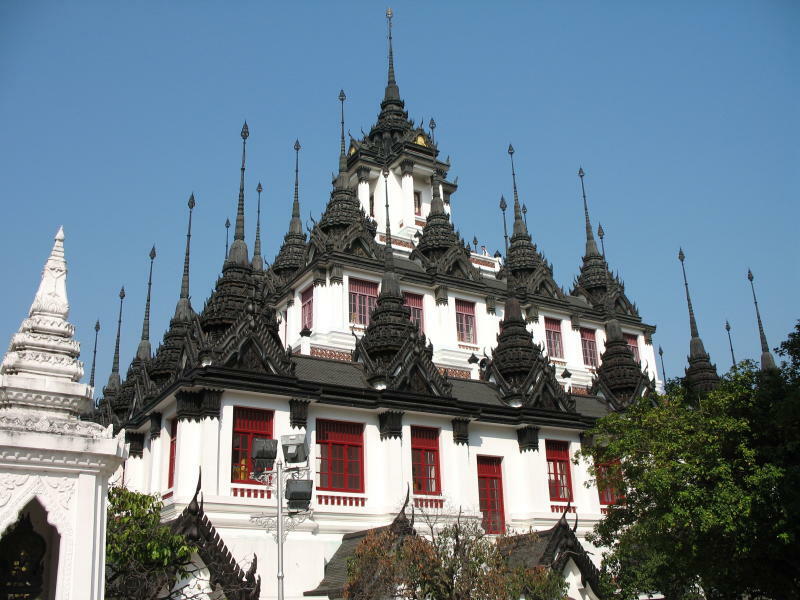 Wat Ratchanadda was built in 1846 and its main building is a copy of an Indian temple called Loha Prasat. Bare corridors extend from a central spiral staircase. Most of the halls were empty, but some had statues at the end. 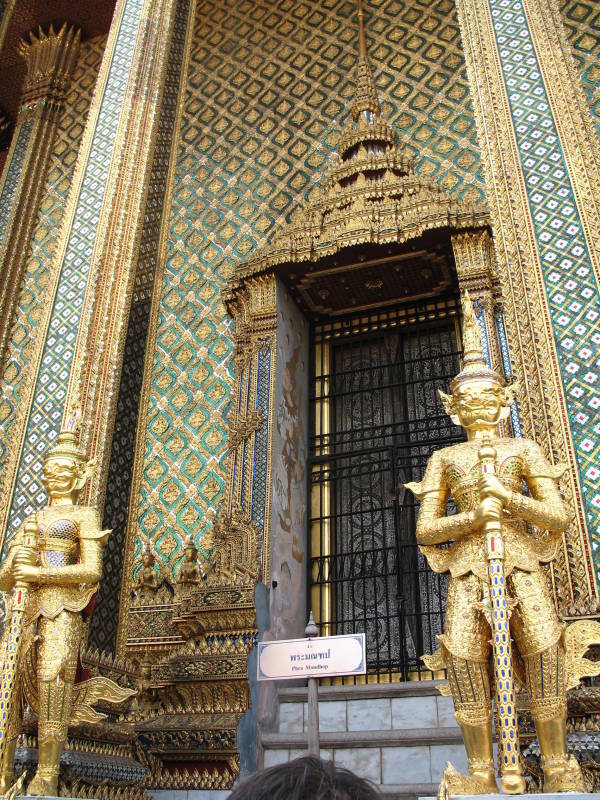 After exploring Wat Ratchanadda, I took a taxi to Wat Phra Kaew, the Temple of the Emerald Buddha. 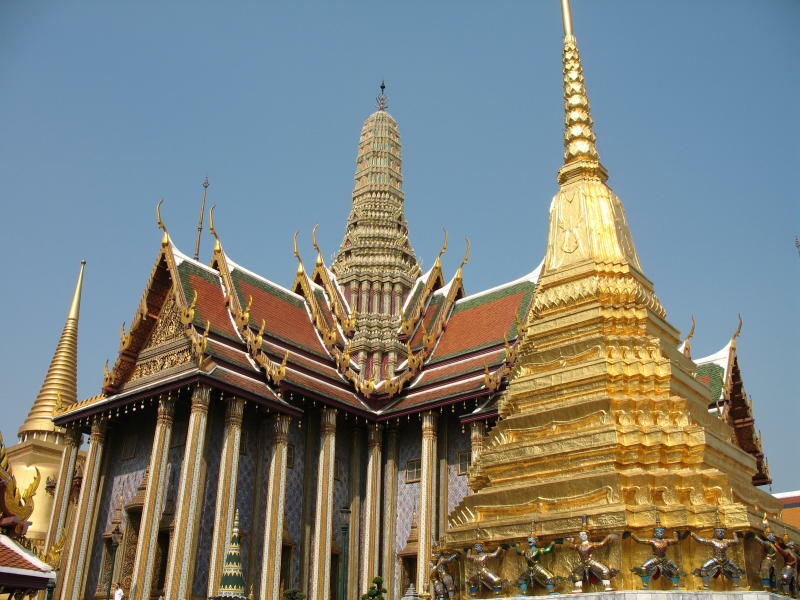 Built in 1782 when the capital moved to Bangkok, the temple houses the Emerald Buddha, a much-fought-over jade statue of unknown origin. Photography was forbidden, but here’s a photo I found online. 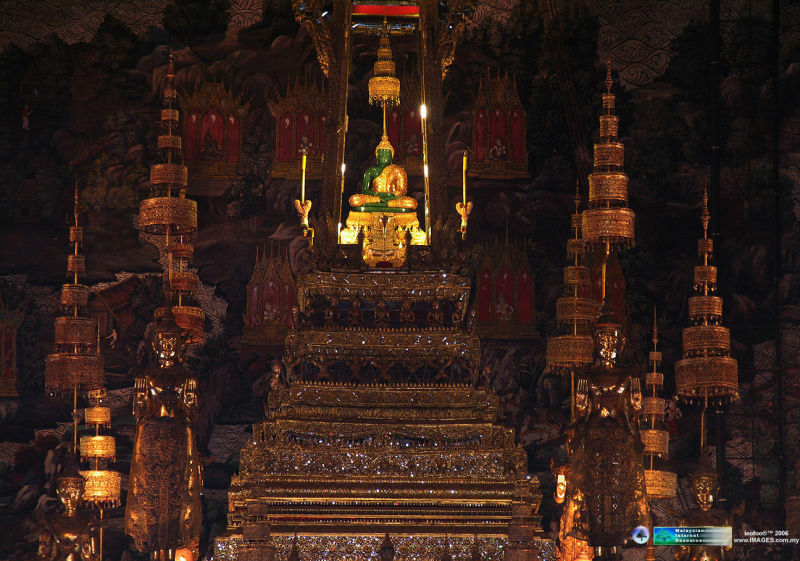 The king of Thailand changes the gold outfit three times a year. This is the rainy season attire. Speaking of gold, there is a lot of it at the temple. And with or without gold, everything is ornately decorated. One could almost take pictures at random and end up with something good, if not for the crowds. Whenever I wanted to capture something specific, I nearly always had to work around the sea of people, and I had to settle for “close enough” for most shots. This is the temple library, by the way. I thought it was fascinating to find so many distinctly Hindu figures in a Buddhist temple. 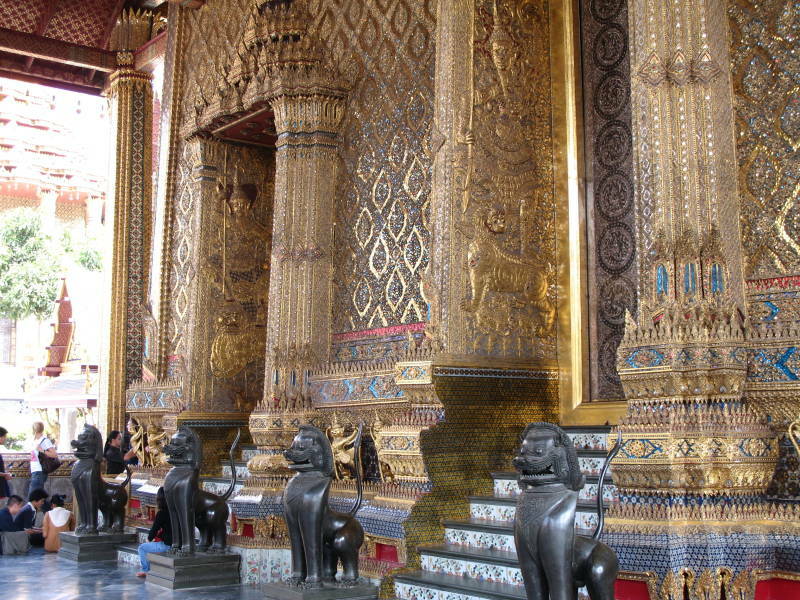 Hinduism came to Southeast Asia before Buddhism, and although Thailand is staunchly Buddhist, many Hindu influences remain. A gallery encircles the temple complex, and there is a mural along its entire length. This is one scene. 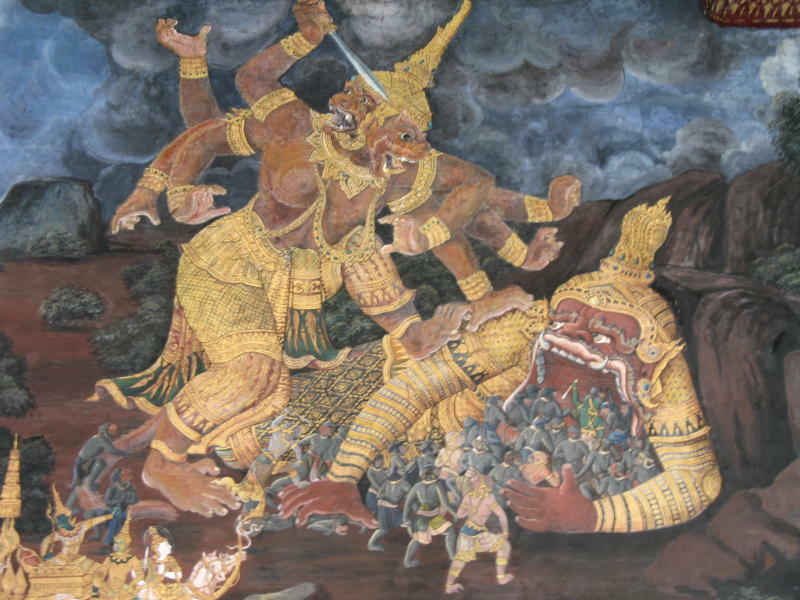 I was baffled when I saw the mural, which has nothing to do with Buddhism, but after a bit of research I found that it depicts the Ramakien, Thailand’s national epic, derived from the Hindu Ramayana. I’m not really familiar with the story, but I gather that central conflict involves the hero’s wife being stolen away by the King of the Demons. In the Thai version, the main character is a prince of Ayutthaya. As for scene above, it shows Hanuman, the monkey god-king, fighting Kumpakan (Sanskrit: Kumbhakarna), one of the demon king’s brothers. Kumpakan, so the story goes, has been cursed so that whenever he sleeps it’s for six months at a time, and each time he wakes, he is so hungry that he eats everything in sight, people included. 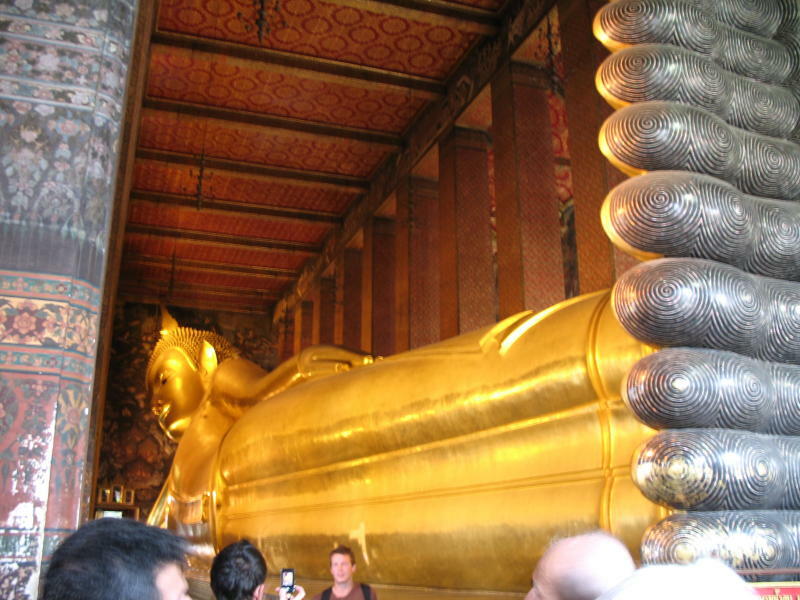 After Wat Phra Kaew, I walked to nearby Wat Pho, the Temple of the Reclining Buddha. The eponymous statue depicts Buddha at the moment of his death. The body of the statue is a bit crude, but the feet are really cool. 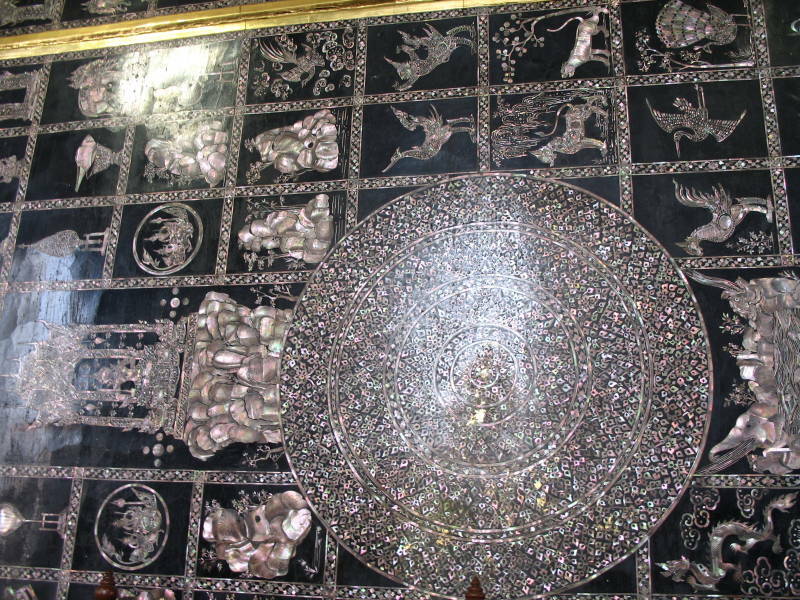 They’re covered with intricate designs in mother-of-pearl inlay. 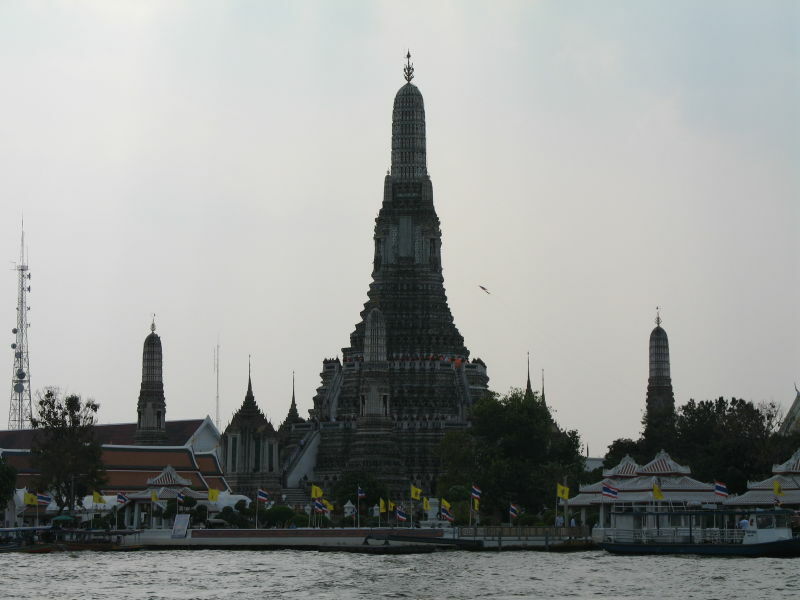 After Wat Pho, I crossed the Chao Phraya River for my last stop, Wat Arun, the Temple of Dawn. The temple dates from the Ayutthaya kingdom, although its towering prang was built in the early 19th century. For a long time it was the tallest structure in the city. The view from the prang is still impressive, even though you can only go less than halfway up. This is the northeast view. 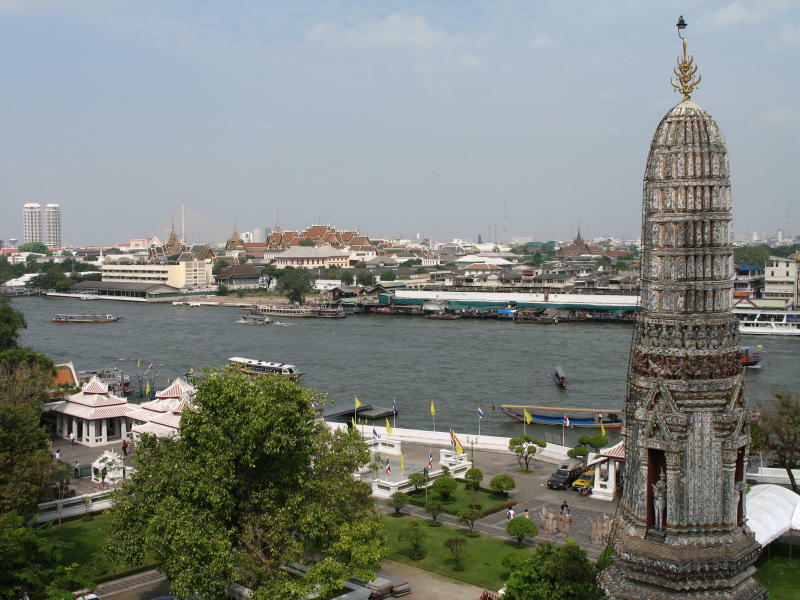 Across the Chao Phraya, the huge, traditional building is the Grand Palace, with Wat Phra Kaew and its towers immediately to the left, and Wat Pho a ways to the right. Finally, this is the southeast view. And that’s that. I’m skipping all sorts of details, but I’ll call this good for now. You are currently browsing the Erratic Dispatches blog archives for February, 2008.